Arlington National Cemetery folks like to say every grave has a story. This time, the grave marker tells the story. Wish it were always that simple. 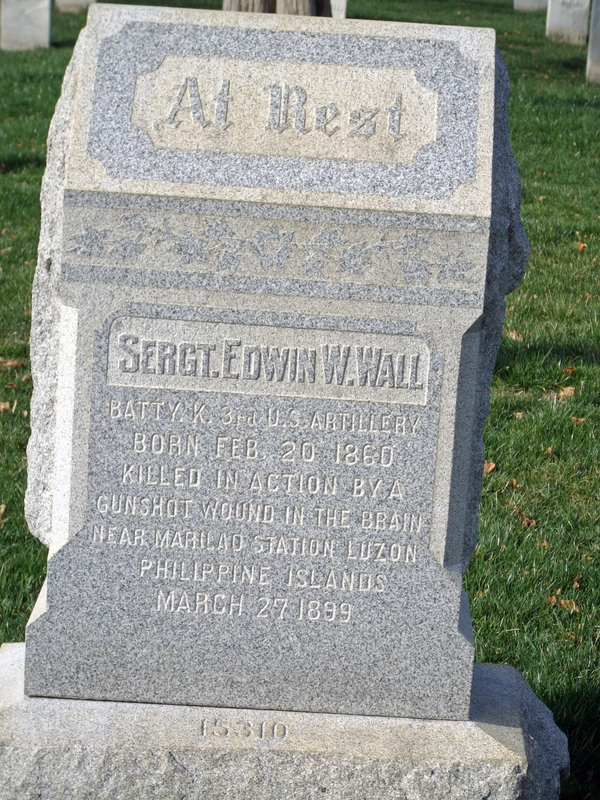 A member of the U.S. Army’s 3rd Artillery, Wall was sent to the Philippines as part of the aftermath of the Spanish American War. The Treaty of Paris in 1898 gave the islands to the U.S. and months later locals were fighting U.S. troops. Despite outnumbered 4 to 1, American forces prevailed. But the 39-year-old Wall was killed while crossing a river 80 yards wide and too deep to ford while under enemy fire. This entry was posted in Arlington National Cemetery and tagged Arlington National Cemetery, Best Washington DC walking tours, grave, Photo by Rick Snider, Sergt. Edwin W. Wall. Bookmark the permalink.